Winner of three races, including the Bellamy Road Stakes at Delaware Park, Uptown Boy also finished second in the Fitz Dixon Jr. Memorial and the Mark McDermott Stakes. With a record of 8-3-3-1, he earned $146,990. So Many Ways was a perfect 3-for-3 in 2012. After breaking her maiden 8 lengths at Parx Racing, she continued on to Saratoga where she won the Grade 3 Schuylerville Stakes and the Grade 1 Spinaway Stakes. She finished the year with $307,800 in earnings. bred by George Strawbridge Jr. Following in the footsteps of his full-brother, 2007 Champion Turf Horse Lucarno, Thought Worthy was campaigned in England, where he won the Great Voltigeur Stakes-G2 and the Fairway Stakes. He also finished second in the Classic Trial-G3 and third in the King Edward VII Stakes-G2. Thought Worthy was the leading Pennsylvania-Bred horse of 2012 by earnings with $337,010. Angel Terrace won three of her five starts in 2012, finishing the season with a gutsy win in the $125,000 Valley View Stakes-G3 at Keeneland. Philly Ace won four of his six starts in 2012, all on the turf. He began the year with two allowance scores before winning the $100,000 Alphabet Soup Handicap at Parx Racing and the $100,00 Tropical Turf Handicap-G3 at Calder Race Course. He was also second in the Robellino Stakes at Penn National and third in Aqueduct’s Grade 2 Red Smith Handicap. The champion 3-year-old and Pennsylvania-Bred Horse of the Year in 2011, Plum Pretty made only two starts in 2012, but she thrived at a high level. She won the Apple Blossom Handicap-G1 at Oaklawn Park and finished second in the La Troienne Stakes-G2 before being retired and sold as a broodmare prospect for a whopping $4.2 million. The 2011 Steeplechase Champion Divine Fortune was again voted Champion for 2012. Although he only won one allowance race in 2012, he finished second in arguably the three best jump races of the year (all Grade 1)—The Colonial Cup, Grand National, and Iroquois and earned $113,500. bred by Mrs. Thomas W. Baker Jr.
Nibiru’s Return led all Pennsylvania-Breds in Breeding Fund money earned with $121,254. He scored three victories in 2012 and earned $57,539 in Breeders Awards, $19,180 in Stallion Awards, and $44,536 in Owner Bonuses. Real Quiet led all Pennsylvania stallions with $99,624 in stallion awards. Stakes-Placed winner of $127,670, Pennsylvania-Bred Bloomy went on to produce graded stakes winner and 2012 Champion Older Horse Philly Ace, earner of $356,966, and Spring of Fame, earner of $429,284. George Strawbridge Jr.’s Augustin Stable led all Breeding Fund Award Recipients in 2012 with $270,322 in Breeder’s Awards. For the sixth year in a row Augustin Stable takes home this award. Horses bred by Augustin Stable won more than $2,772,000 racing in North America and Europe in 2012. 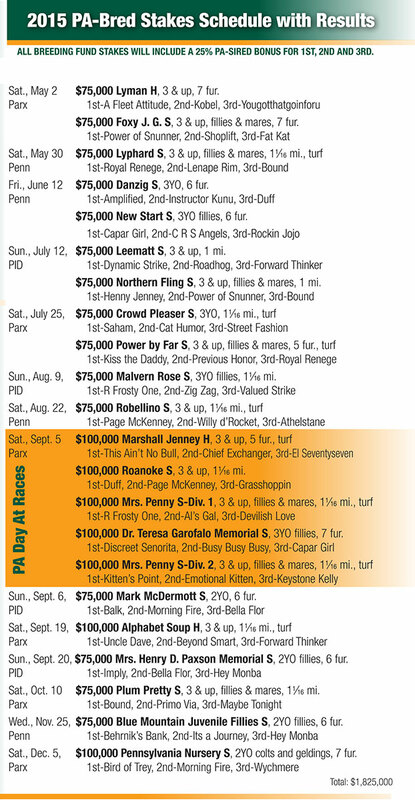 Major earners include 2012 Pennsylvania-Bred Champions Thought Worthy and Angel Terrace. Other notable contributors were new millionaire Smart Bid and Group 3 winner Seelo (in Australia). PHBA’s website is for general informational purposes and should not be considered conclusive. Anyone interested in becoming a breeding fund participant or seeking information, registering foals or stallions should contact the PHBA office for specific guidelines.